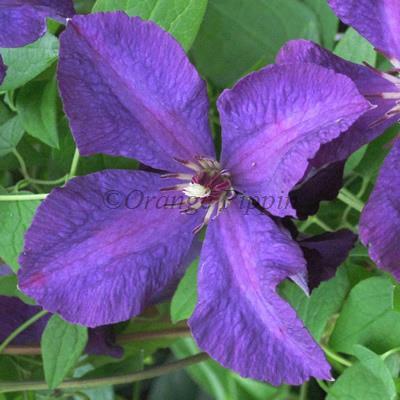 Clematis viticella 'Polish Spirit' produces vibrant, deep purple-blue flowers with a slight purple red bar or stripe to each of the petals from July to September. This non-evergreen climber can be grown against a trellis, garden fence, wall, arches, pillars, pergolas, clambering over tree stumps or through large shrubs in the flower border. Clematis viticella 'Polish Spirit' was raised by Brother Stefan Franczak of Warsaw, Poland and introduced by Ray Evison of Guernsey Clematis Nursery.